To provide a beautiful and positive learning environment for all our students. To help every child preserve the 'childhood' and yet prepare him/her for the challenges of life. 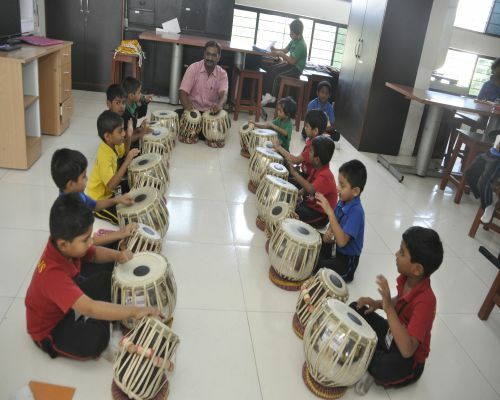 The children here are treated like delicate flowers where they grow naturally while learning by playing. The method is a Child Centered Play Way Concept, the effect of which will last in them for a lifetime. We believe in imbibing right human values and morals creating a strong foundation true to our motto. Your precious little heart throbs are taken care of with great love and they learn, play and grow in a loving and cordial atmosphere. The school follows the child centric method where children learn through the play way method so the concepts that are taught to them are imbibed in their minds forever. Teaching of right human values and morals is considered of prime importance to create a strong foundation for them true to the motto. In the assemblies, after the prayers. facilitators and Senior KG students talk about the topic of the week and explain it with flash cards and real objects. The school celebrates ‘colour days’ to introduce primary colours to tiny tots. We help our students do specific (colour) activities related to that colour with various methods, to give them hands on experience. For Sr. KG. Level, the facilitators explain how to mix two primary colours and get a different shade of colour. English Oratory - Students are told to recite English rhymes and songs, which are age appropriate. Solo Dance Competition- Students perform Solo dances on the songs appropriate for their age group which helps them tobuild up their stage confidence. Colouring Competition - To observe the student’s sense of fineness in colouring and brilliance with experimenting with colours. Fancy Dress Competition - This competition is conducted in the month of January- Age appropriate themes are given and students turn up in ‘out-of the-box’ costumes, portray the character through dialogues/songs/speeches. This builds up stage confidence in them. Fine Motor Skills’ Activities Clay, sand tray tracing, beads, lacing, crayons scribbling, painting and craft activities are provided to develop the fine motor skills. Gross Motor Skills’ Activities Exercise, jumping, hopping, running, walking on straight and curved lines and dance activities are held every week to develop the students’ gross motor skills. 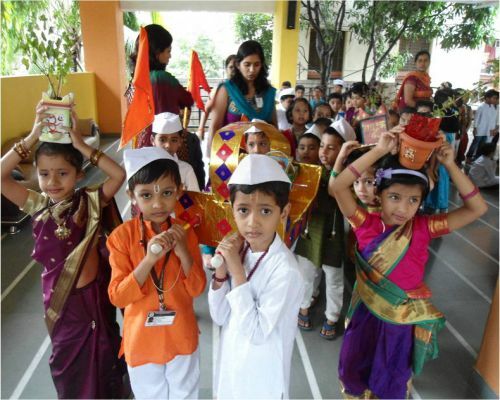 Palkhi- is celebrated with great religious fervor and students come in traditional wear. The Palki is carried by them with the chanting “Jai JaiVitthal”. Gurupournima- is celebrated by making cards for their Guru and stories like Eklavya are narrated. Dahihandi-is celebrated by breaking the handi filled up with goodies. Students come in traditional wear and Sr. KG. Students dance away in merriment- Govindaaala re. Ganesh festival- is celebrated with the Aarti. Students colour a picture of Lord Ganesha. Navratri- Dandiya fete is organized for community service and all students come in Dandiya dresses with their parents and enjoy the event Dandiya. Diwali- Diwali party is enjoyed by decorating the classes, colouringdiyas and gifting them to their friends, making of lanterns and eating faraal. Christmas- is celebrated with songs and chocolates by Santa Claus. Shiv Jayanti- is celebrated by Dramas/stories of Shivaji Maharaj by Facilitators. Children’s day- is celebrated with a puppet show, games by facilitators, tattoos and chocolates are distributed. Ghatsthapana- Sr. KG. students sow five types of grains and observe it for nine days. Grandparent’s Day- Various games are conducted by facilitators for the grandparents, (Ramp walk are conducted, Queen and King were crowned.) Sport’s week and sport’s day, Reading week, Graduation day for Sr. KG.students are a few activities held in the school. is celebrated with great religious fervor and students come in traditional wear. The Palki is carried by them with the chanting “Jai JaiVitthal”. The school aims at an overall development of the students covering moral, physical, intellectual,emotional and social dimensions through training and helps them become responsible citizens of our country by making them open their minds to receive and become lifelong learners. New D. P. Road, Kothrud, Pune.